Isn’t is fascinating to fly in the air? Aren’t we all in awe of the trapeze artists in circuses who twist and turn while suspended in air? Wouldn’t it be nice to do something like that? If your answer is yes, aerial yoga is what you should be doing. Light and rejuvenating, it is all things good. Take a look below to find out what aerial yoga is all about. Aerial Yoga or Anti-gravity yoga is a combination of traditional yoga asanas, acrobatics, and dance moves done suspended in the air with the help of a hammock. It was conceptualized about a decade ago by fitness practitioners in New York to make exercise sessions more enjoyable. Also, certain challenging yoga poses that are tough to assume on the ground are much easier to practice when you are suspended in air. 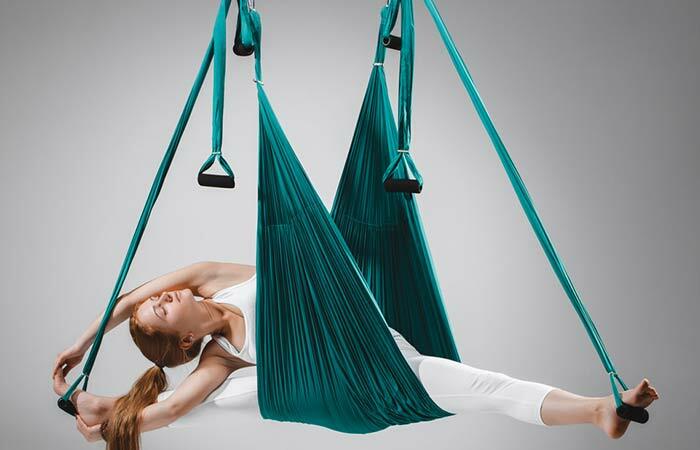 You can try all the yoga poses suspended in air, with some specially adapted for aerial yoga. Air Yoga and Antigravity Yoga are some of the other names of Aerial Yoga. 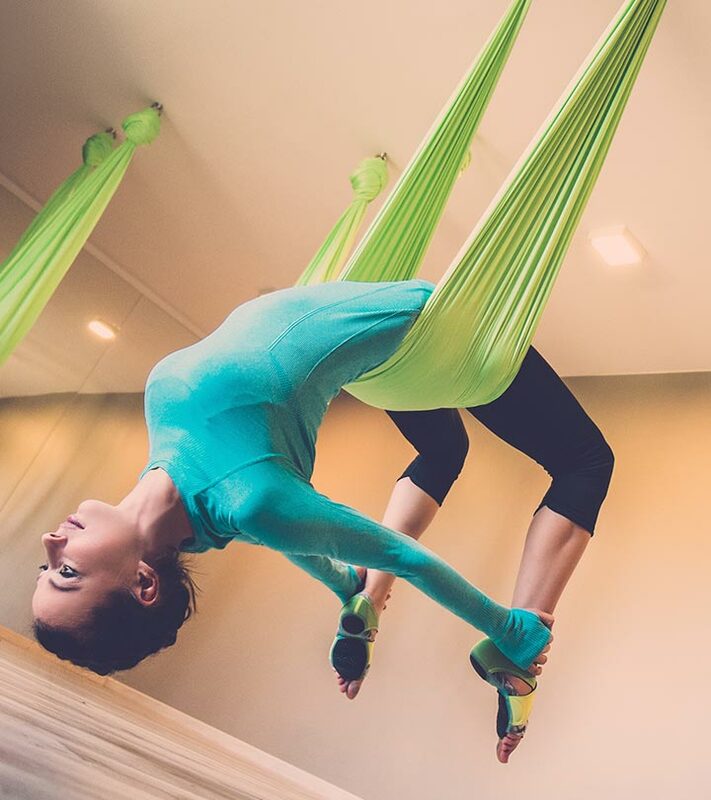 To practice Aerial Yoga, you require a hammock suspended from the ceiling by support chains about 2 to 3 feet off the ground or as per your convenience. You need not worry about the hammock tearing with your body’s weight and the pressure you thrust upon it during exercise as it can take weight up to 300 kilos. The hammock will add variety to your yoga session, and the fun of doing asanas in the air is unmatchable. Take a hammock made of high-density nylon material and suspend it from the ceiling to a level convenient for your height. You can tie it either at your hips or your arms. Get your mat too as you can place it on the ground below your suspension and place your feet on it whenever you touch the ground in between poses or in poses where a part of your body is touching the ground. Suspension from the hammock eases pressure on your body, creates space in your joints, decompresses your spine, and makes you more mobile. Now, this is an ideal situation where you get to practice all the asanas that you found difficult practicing on ground. Inverse poses like Sirsasana and Halasana become much easier in air. There will be no pressure on your head and spine, thus preventing neck and back pains. You will be able to flow through a series of traditional yoga poses easily, like Tadasana, Adho Mukha Svanasana, Gomukhasana, etc., with the added fun of doing it suspended in air. While doing these poses, make sure you connect your breath to your movements, go deeper into the pose and hold it for a longer time. As, there will be less pain and pressure on your body while you are suspended, holding the pose for a longer time becomes easier, ensuring a better understanding of the yoga poses that can be implemented on the ground. The following video will guide you through the process. Aerial Yoga is safe as long as you learn and practice it under the guidance of a certified yoga instructor. The instructor will help you perform the poses in the right manner, saving you from injuries. Make sure you don’t suspend yourself too high from the ground to avoid falling and getting hurt. You should be wary about the amount of time you spend hanging upside down as it might lead to complications. Make sure you are barefoot and wearing loose cotton clothes for easy maneuvering through the mattress. Take a light meal and drink lots of water before practice to prepare for an intense workout. Avoid alcohol and smoking or intake of any drugs before an aerial yoga class. Do not apply any lotion to your hands as it might decrease your grip on the hammock. Remember to remove all your accessories and trim your nails before the session to avoid any damage to the hammock. It is best to avoid Aerial Yoga if you are pregnant, have eye diseases, recently underwent surgery, have heart issues, bone problems, high or low blood pressure, prosthetic hips, and blockage of the nasal passage. If you are suffering from arthritis or glaucoma, it is best to avoid the exercise. Also, if you suffer from inner ear conditions, vertigo, head injury, obesity, or wounds or have a tendency to faint, or if you are taking medication that can cause light-headedness, it is best to avoid the practice. 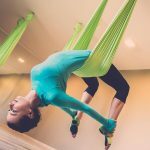 Now that we know what Aerial Yoga entails, let’s have a look at some of the commonly asked questions regarding the practice. Will I be able to do Aerial Yoga in the first class? Yes, with a good instructor, you will be able to pick the method in your first class and practice it successfully. What should I carry along to my Aerial Yoga class? Take a water bottle, a sweat towel, and an open mind to learn and practice well. How does it feel after a session of Aerial Yoga? You will feel lighter and refreshed after a session of Aerial Yoga. What if I am afraid of height? In Aerial Yoga, you are no more than 3 inches off the ground. And most of the time, your weight is distributed between the hammock and floor. Do I need to be a yoga practitioner to do Aerial Yoga? You don’t necessarily have to be a yoga practitioner to do Aerial Yoga. All you need is a willingness to learn and practice. Aerial Yoga is an excellent way to understand your body dynamics with the ground and when suspended in air. It is a fun workout that gives you a never before experience of flying. Join an Aerial Yoga class and experience the magic that will unfold. 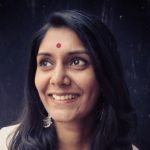 Shanti Yoga – How To Do And What Are Its Benefits?